Editor's note: This feature originally appeared in the February issue of DS News. In her role with the Padgett Law Group (PLG), Keena Newmark leads the firm’s bankruptcy practice, the practice’s national unit, related bankruptcy litigation, and oversees the firm’s expansion into Texas. She is based out of PLG's Dallas, Texas, office. Newmark has dedicated her career to the representation and advocacy of automotive and residential mortgage servicers and lenders. Her practice areas of expertise include bankruptcy law, bankruptcy litigation, and general creditors rights’ practice. 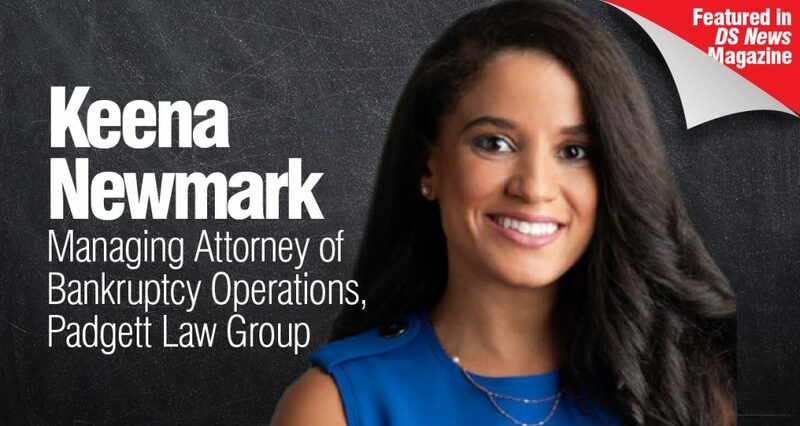 Throughout her career, Newmark has worked alongside numerous national mortgage servicers to advise on the federal and state laws impacting bankruptcy, litigation, and other areas of the default servicing industry. As a leader, Newmark employs a client-centric approach to provide strategic solutions to complex legal matters. Most recently, she has been focusing on implementing and improving servicing processes and procedures with a particular focus on individual consumer and commercial filings. Newmark is uniquely experienced in legal and operations with specific experience in bankruptcy, bankruptcy litigation, and general creditors’ rights practice. Before joining PLG, she held various operational leadership and attorney management roles at two large national bankruptcy practices. Her experience has afforded her a deep understanding of the challenges many creditors face while servicing an active bankruptcy. How does the current low-level environment for foreclosures and delinquencies translate into the bankruptcy world? Do they tend to run parallel? It does have an effect because sometimes a bankruptcy is filed as a result of a borrower wanting to cure their mortgage, so there is a correlation. We have taken the current environment as an opportunity to evaluate efficiencies within our firm. Are the right people in the proper roles? Can we make processes that are manual more systemic?It's about enhancing the experience for our servicers. We're not only maintaining but increasing relationships during a time that most are losing volume. We haven't let the volumes take us off course from the mission, which is continuing to maintain and grow. During times of reduced volume, some firms view people as the first source of reducing costs, but what we've tried to do is examine people as part of the solution instead. We look at the subject-matter expertise of each individual and try to determine what we can offer the servicers, whether in a project context or outside of default but in a general servicing aspect. It’s about shifting resources, and it’s done well for us in that regard. From a bankruptcy context, it's been two-fold. We are continually growing because we're taking the holistic resources of the firm and using them to build efficiency and a better product for the servicer. Within that, there's also an examination of that particular resource for use for the servicer. So we're using that resource both internally, to develop or enhance technology or processes, and also externally to the servicer. What service have we not offered before, whether it's by project or permanent, that we now can provide because we have the subject-matter expertise to do so. As far as a relationship between default volumes and bankruptcy, the purpose of bankruptcy is securing a fresh start. There's no time limit to when the borrower is seeking it. So whether that's a default before the point of foreclosure or an act of foreclosure, it might be the first opportunity when the borrower understands that bankruptcy might be a way for them to stay within their home and cure their arrearage. From a firm perspective, we make sure that once someone has filed bankruptcy, if there is an act of foreclosure in place, we're being mindful and stopping the proceeding in the state court because of the stay. It's important to have a strong process in place to communicate quickly and timely, so we're ceasing all foreclosure actions, or the servicer's foreclosure firm is ceasing action. Then we can proceed with whatever recommendations we may have in the bankruptcy context. Within the bankruptcy space, what are the particular challenges that you're confronting right now? One hot topic right now within bankruptcy is safe harbors. Essentially, what is considered “reasonable bankruptcy attorney's fees”? That impacts recoverability against the borrower for the servicer, but it's also going a step further right now as far as determining what the proper mechanism for collecting those bankruptcy attorney's fees is once a reasonable amount is set. Another item is just the overall legal landscape. From a bankruptcy perspective, when you have both footprint states and a national bankruptcy practice such as Padgett, you need to be aware of jurisdictional rules, case law that's developing, which changes are happening, and the actions of agencies such as the Consumer Financial Protection Bureau (CFPB). Making sure we are digesting all that information promptly, having proper change management controls so that we're notifying all attorneys and operations, and then notifying our clients with a recommendation so that they can continue the discussion. It’s a daily evolution of those items in the legal landscape. Everyone's interested in what's going to happen with the recent confirmation of Kathy Kraninger to the CFPB. She's mentioned that she wants to pave her own way, so we're all looking to see what that means. What does that chain of communication look like between the firm and your various servicer clients? I’ll give you an example. There was an alert that happened from the trustee that came out of a particular jurisdiction. So we met internally as part of the Attorney Bankruptcy Committee and discussed the effects of that letter. From there, we then created a formal change-management submission. The Change-Management Committee met for us to discuss implementing the change and what that looks like. Once it was approved, we created a pair of email blasts—one for internal and one for external. The internal one concerns what needs to be changed and working with IT and compliance to change the system of record, as well as instructions for the staff and how to better understand that change. We do something similar externally. We had a blast that went to all of our contacts on the list from our various client servicers, and it explained what the notification was, what the change is, what our recommendation is—an easy how-to guide, if you will, with points of contact for escalation. We try to make sure that as we find out things, our servicers do as well, but it's always paired with a recommendation so that we can be helpful to the client. What is it that you enjoy about working in bankruptcy operations? I love managing people—looking at a team, identifying who's best at research, who's best at litigation, who's best at all these different pieces that are needed to make a successful bankruptcy team. I love that daily challenge of that. Bankruptcy is a moving target; there's a structure, but there's also quite a bit of gray. Attacking these problems is a daily challenge, whether it's case law that changes the way that we may look at a litigated topic or a consent order that our client may face. It's just problem-solving. What do you wish more people understood about what you do? The biggest misconception is about what the role of the bankruptcy attorney or bankruptcy firm is. We are an extension for facilitating communication on behalf of the servicer. But the servicer’s goal and the servicer firm's goal is to resolve the matter and make sure that it's done compliantly and to the benefit of the borrower. It’s that “to the benefit of the borrower” part that people don't quite understand. We are here to facilitate and communicate, but we all want to come to a resolution that's to the best benefit of the borrower. We have the common objective, so let's communicate with one another to figure out what that is. We're not playing on opposite teams; we're playing on the same team.